Magic City Bicycle Collective is Open! 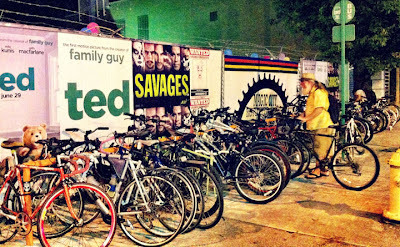 The Magic City Bike Collective will open Tuesdays and Thursdays from 5-9pm, and Saturdays from 2-6pm. If you are interested in volunteering, please stop by during those hours for orientation and training. They will officially open to the public on July 17th. The community workspace will provide affordable prices on used bicycles and parts, maintenance classes, repair services, and educational workshops. For $5 an hour you will be able to use their space and tools to work on bikes. Locals can also "Earn-A-Bike" by volunteering a minimum of 20 hours at the collective. They'll also host a "Ladies Night" on the last Thursday of every month where females can come learn the basics of bicycle repair from other women. If you have any unwanted bicycles, parts and/or tools feel free to donate the item(s) to the collective by dropping them off during business hours. "Like" the Magic City Bike Collective on Facebook, follow them on Twitter.